Learn how to make homemade Lebanese falafel recipe with dried chickpeas, loads of fresh herbs and warm spices. Serve with creamy tahini yogurt. If I could live in any cuisine for the rest of my life, it would be Middle Eastern. Of course I am retracting myself as I write this because in my little bio page I talk about how I can live in Chianti and red wine for the rest of my life and be happy. So, if there were 2 cuisines I had to chose from, Italian and Middle Eastern would be it. I grew up on a lot of ethnic foods, especially Sephardic cuisine, but falafel never made a huge appearance growing up. I would have it here and there when I would stop in the Mediterranean markets and now that I’m older, it’s the first thing I order whenever we eat Middle Eastern. See, falafel has simple but intense flavors. Chickpeas or fava beans with fresh herbs and spices, that’s it! 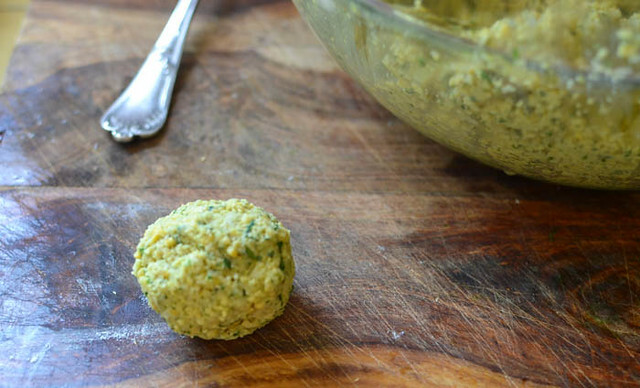 Can you make falafel with canned chickpeas? I always have canned beans in the house but with falafel, dry is best and I wouldn’t recommend making falafel with canned chickpeas. The texture ultimately changes and because canned chickpeas are so soft, you would need to add a lot more flour to hold the batter together. 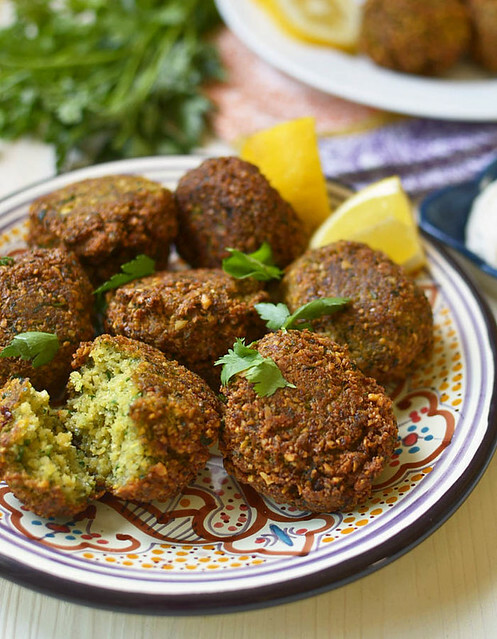 After dried chickpeas are soaked and fried, the falafel becomes incredibly crisp on the outside and tender in the middle. You wouldn’t get that satisfaction with canned chickpeas. 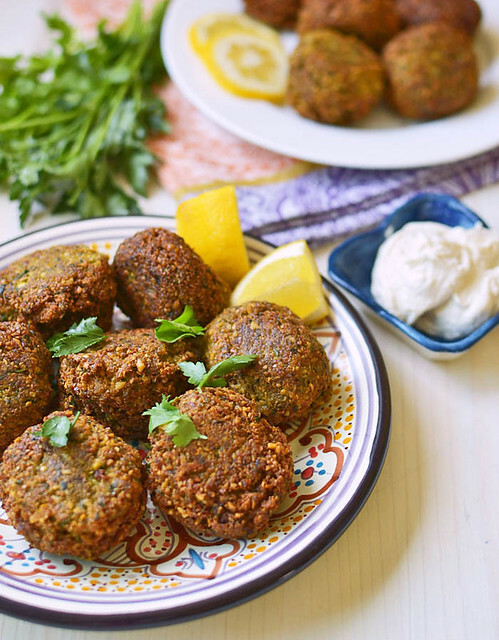 Authentic Falafel Recipe is easy to make with a few key steps. What I love so much about falafel is how easy it is! The only preparation you have to do is soak beans overnight. Which is pretty cool to see. The beans are small and hard but once they soak up all the liquid they expand to double its size! I also love the flavor combo! Fresh and leafy greens like parsley and cilantro dye the fritters pale green and cumin and coriander provide smoky and deep flavor. These are some f my favorite flavor combinations!…I’m getting hungry just writing about this! 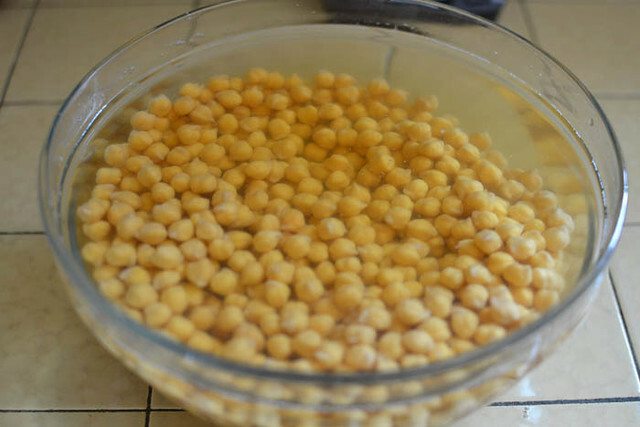 1) Soak dried chickpeas overnight in a large bowl filled with water. 2) The next day, drain the chickpeas and pulse in a food processor until crumbly and there are no whole chickpeas left. Transfer to a large bowl. 3) In the same food processor, pulse together the onion, garlic, parsley and cilantro. Pulse until it almost looks like a paste. Add parsley mixture to beans. 4) Use a large spatula to mix the beans and herbs together. Add cumin, cayenne, salt, pepper and flour. Mix well. Add baking powder and soda just before frying. Mix everything well. 5) Heat a large skillet with vegetable oil and bring oil up to about 370 degrees F. You can test to see if the oil is hot by dropping a small piece of batter. If it sizzles, it’s ready. 6) Use a large tablespoon and form batter into balls. I scoop about 2 tablespoons worth and form a ball between your hands. 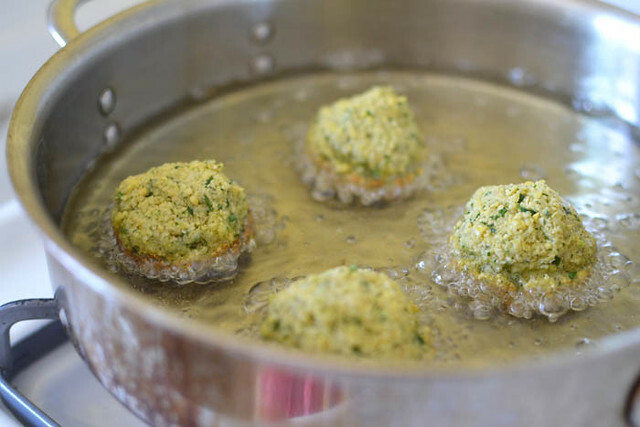 7) Carefully place the falafel in the hot oil. You can fit 4-5 in at once but don’t overcrowd the pan. Fry on 1 side until you can see it browning on the sides, about 4-5 minutes. Then flip over and fry other side. 8) The falafel should be crisp on the outside and soft on the inside. To make tahini yogurt, just ix tahini and Greek yogurt together. 9) You can eat alone with tahini or make a falafel sandwich with pita bread, tomatoes, cucumber, pickles and tahini. Looking for more classic Mediterranean recipes? I have a slew of them! My family’s recipe for fasulye (Turkish green beans) is always a favorite. You can also serve my homemade falafel with Israeli chopped salad! Soak dried chickpeas overnight in a large bowl filled with water. The next day, drain the chickpeas and pulse in a food processor until crumbly and there are no whole chickpeas left. Transfer to a large bowl. In the same food processor, pulse together the onion, garlic, parsley and cilantro. Pulse until it almost looks like a paste. Add parsley mixture to beans. Use a large spatula to mix the beans and herbs together. Add cumin, cayenne, salt, pepper and flour. Mix well. Add baking powder and soda just before frying. Mix everything well. Heat a large skillet with vegetable oil and bring oil up to about 370 degrees F. You can test to see if the oil is hot by dropping a small piece of batter. If it sizzles, it's ready. The falafel should be crisp on the outside and soft on the inside. To make tahini yogurt, just mix tahini and Greek yogurt together. 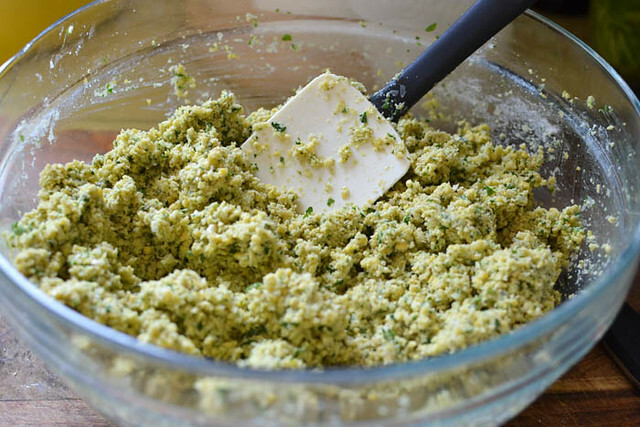 Make sure to add baking powder and baking soda within 20 minutes of making falafel. Holy Moly! this look awesome! I love falafel! I made them once but I baked them instead of frying. Oh these look amazing!! I love chick peas and want to try these real soon. Gorgeous looking falafel! I could eat these every day and be content. Next time you visit NY, there are a could of great falafel places I need to take you too. Yes we are so due for a trip back home!! These look amazing! Beautiful photos too! I’ve made falafel before, but your recipe is by far the best we’ve had……had them two day’s in a row. They were a total hit with all eight of our children….even the littles. Thanks so much! Hi Kristi!! That makes me SOOO happy…thank you so much!!! I am so thrilled you AND the kids enjoyed falafel!! 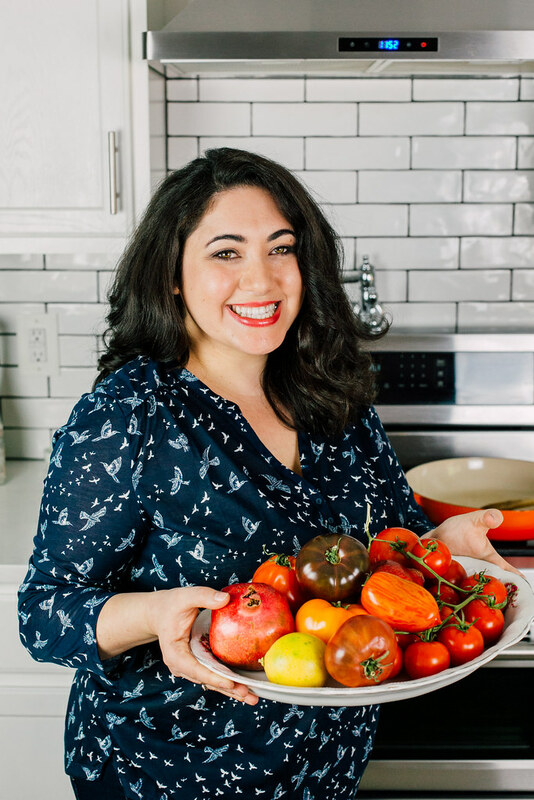 Let me know if you have anymore recipe suggestions and thank you so much for following my blog! Superb! Just like the first falafel I had in Arabia 20 years ago, I’ve had trouble finding anything equally good ever since. Halving the quantities still gives more than enough for two. I served it the traditional way, with salad in an Egyptian flatbread “pita”. I din’t have any yoghurt so I put just a little tahina on it. Hi Paul! Yes this batch does make enough to feed an entire family..lol So glad you enjoyed it! Mine’s didn’t turn brown at all!!! And my oil was hOT! Hi jess! So sorry it didn’t work out! How many did you put it? The more you put in, the lower your oil temperature will get, that is why I recommend just putting in a few at a time. Did you test the oil and did it sizzle? If it sizzled, then your falafel should have browned up nicely. Hope you try it again and let me know if you have any more questions! Thanks! Yes my oil sizzled- I put 3 at a time. I’m gonna try again next week, but this time I’ll pass it over egg yolks , flour & bread crumbs and leave overnight. My stepdad is Lebanese, he told me to try it that way, we’ll see. Hmm..gosh I wish I was there to see it..lol I am also wondering..did you use dried chickpeas or canned? The mixture is more of a “dryer” consistency since all it has is the ground beans, herbs and spices! I have never had falafel with egg..so I have no idea how it will come out. Please let me know! Thanks Jess! Maybe that was it? That’s why it May have been so mushy ….I’ll try it next week with dried ones. Thanks so much for your replies! @Jess : I know its late, but FYI: If you are using canned beans, you can skip the first step (soaking the beans overnight). @Samantha : very nice preparation and photographs. Loves your webspace. You have got a new follower from India. Samantha, I adore falafel and enjoyed it at a couple of LA eateries back in the day. Haven’t quite found a place in the north that grabs me, but this recipe, by all accounts, looks to hit the mark. Pinned for a trial in the kitchen soon! One of the most enjoyable recipes I’ve ever made and eaten! This is definitely going to be one of those go-to recipes for me – full of flavour, beautifully crisp, and the yoghurty type sauces just work perfectly. I will be recommending this recipe to vegetarian and non-vegetarian friends alike. In fact, I’m going to make it for my mum the next time I see her! 🙂 Thank you for the recipe! You are wonderful Tom..thank you!! Making this for your mom makes my heart warm 🙂 I am planning on a “non-traditional” black bean falafel in the near future as well! Looking forward to it, and by a coincidence I bought some dried black beans recently! Making this recipe was also the first time I had ever deep fried, much easier than I thought! Will be eagerly following your site from now on, well done. Good recipe, but it’s really temperature sensitive, and for that reason probably not good for a beginning cook. 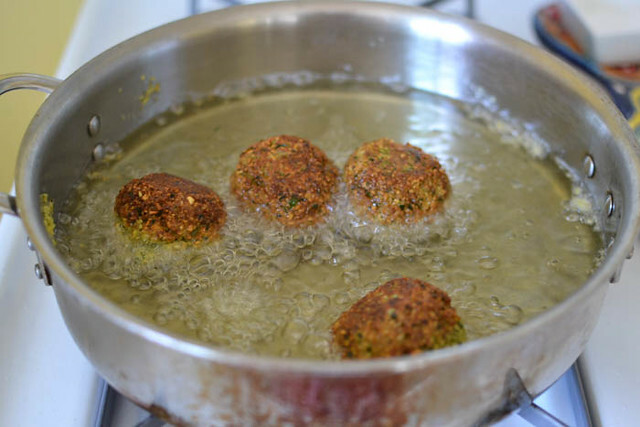 Falafel will sizzle in oil that’s not even close to hot enough, and then disintegrate into the oil because it didn’t brown fast enough to hold the falafel together long enough for it to cook. The oil really has to be at least 370 degrees F at the point you’re putting them in the pan. Best to use a cooking thermometer. Short of that, you should notice them start to brown almost right away when the oil is about the right temperature. As you see them turn brown you’ll probably want to turn the burner down to give the inside a chance to cook without burning the outside. They cook fast so be prepared to not multi-task. Ours were ready to turn over after about 3 minutes. Thank you for your great tips Walker!! The sizzle test has always worked for me, but yes I do sometimes adjust once several falafel are in the pan since it lowers the temperature. This recipe is absolutely brilliant. Having lived in the Middle East, I was taken right back with the taste of these delightful little falafels. I used canned beans and had no problems, but was sure to make sure my oil was very hot. Oddly, it only made 9 (the recipe says 24-30), and it only took about 1-2 minutes on each side. Not sure what happened there, but it doesn’t matter, because they were great! Just stopped by to rave about your recipe. I’ve been making falafel for years and was never entirely happy with the results. Using soaked dried beans is really magic! It gives the falafel a nuttier texture which is really delightful. 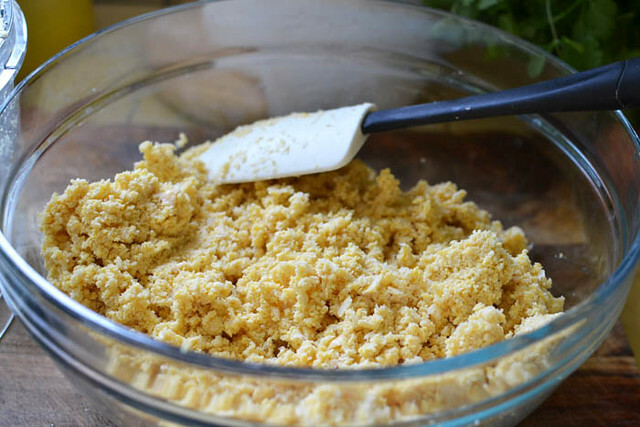 I had a bit of trouble keeping mine together when preparing to fry — way too crumbly — and this was resolved by putting a couple of big spoonfuls in the blender and then adding it back to the mix. I used a cast iron pan set at just below medium and had no temperature issues, although 5 minutes each side would have been far too long in my case. 2 to 2-1/2 minutes was enough. Anyhoo, thanks! This one’s a keeper at our house for sure. Hi Lara!! So happy you were able to adapt the recipe to your cooking method…I haven’t even thought about using the cast iron to fry! I think I’ll try that next time to see if it will get even crispier! I love using dried beans now…all you have to do is prep to soak and that’s it! Thank you for your lovely comment! YUM I just made it and they are SO DELICIOUS !! THANK YOU very much for recipe.Yum . Yay that makes me so happy!! Hi, I did a quick soak, boiled chickpeas 3min. Then let them sit today, so they look ready! I am going to try these tomorrow, they look delicious! Could I bake them? I try and stay away from fried foods. I know they will not have that lovely crispy exterior, but maybe a little olive oil on the pan and a light bread crumb (panko) on the outside? And flip. What do you think? Lovely food blog! This looks amazing, and I have both dry black beans and chickpeas sitting in my cupboard (I’ve never used dry beans and am anxious about it, haha!). I just have a question about the last sentence after the directions – “make sure to add baking soda and powder within 20 minutes”. Add a coating to the falafels? Is it necessary (what does it do)? Thank you in advance – I am so looking forward to trying this out! Hi Shauna!! So stoked you are making falafel! This is the traditional recipe, but I also have one that uses black beans for a Southwest flair (check that recipe out). 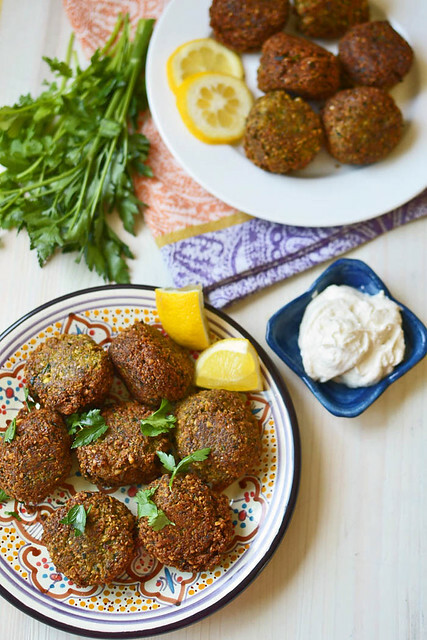 Using dried beans is not hard at all, even easier with falafel because you’re not cooking them, but make sure you are soaking the dried beans for several hours!! You HAVE to do this, preferably overnight. As for the last sentence, it just means to not add the baking soda until you’re ready to fry. SO you can make the mixture ahead and then when you’re ready to dry, stir in the baking soda. Hope that helps..can’t wait to hear about it! Well done Samantha! 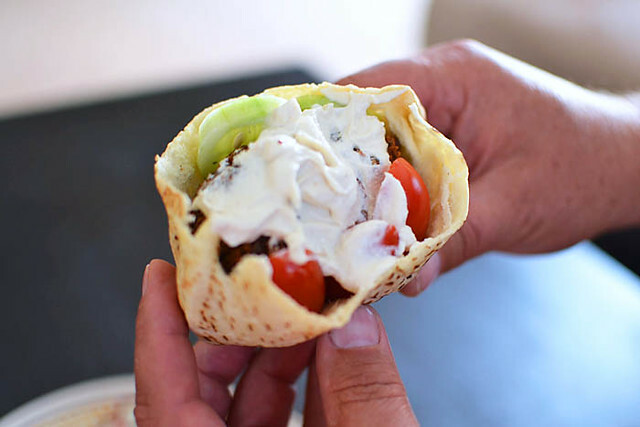 I am pleased to find your page for Falafel recipe and I found great information here. Keep the good work up…. Thank you so much Waheed!